Prior to a week or so ago when I completed Diablo III, I couldn’t tell you the last game I finished. When I was younger it was no problem at all for me to knock out a game, but not so much anymore. It seems to have become a trend with my gaming more often than not. I can’t exactly put a solid reason on why this is either. Maybe its part of growing up and getting older, as well as being more responsible now that I have kids. Maybe I’m getting worse about intensely focusing on one thing for an undetermined amount of time when it comes to my leisure activity. Again I can’t be sure what the exact cause is and it seems highly likely that its really a combination of multiple things, but I just don’t seem to finish games any more. The most recent example I can toss out is Mass Effect 3. Yup. I said it. I write for a site whose name is based on a highly popular ME character and I haven’t finished the series. Put your pitchforks and torches away; I am getting to it. Really. In fact it is sort of a personal goal I hope to get out of this article is getting myself to finish one of the great sci fi gaming stories of our era. I love the series. Its wonderful. I even got up early on release day to pick up my copy because I managed to miss the preorder for the CE, drove the hour drive to my local best buy where a friend who works there told me they had some unreserved CE copies but I needed to be there early if I wanted to get one. All this with a 4 year old and an infant in tow. If I don’t like this series then I have some seriously deep issues that need looking into after going to that much trouble. I just for whatever reason stopped playing it a few days in. Not for any particular faults or even spoilers; I have in fact managed to remain spoiler free on this one despite many friends having already completed the story including the other members of our site. That all said, I plan to soon join the ranks of those who finished it within the next few weeks or possibly sooner depending on real life and such. If for some reason I don’t manage this then I place the blame solely on Blizzard. Oh yes that’s the other contributing factor. Blizzard games are my weakness. I always come back to them. I “run” a small community of friends who play Blizz games together which basically makes me the guy with the GM tag in WoW and the one with admin rights on internet based gathering areas. I’m really a figurehead, nothing more. So let’s all hope I can put down D3 and the WoW Mists beta long enough to finish a round of ME3. Besides, I have plenty of others on the back burner as well. Assassins Creed Brotherhood, Portal 2, Borderlands, Bioshock 1 & 2, Halo ODST & Reach, Skyrim, and on top of those I just picked up Humble Indie Bundle V last week. So there you have it friends. I have a problem of not finishing my games. What about you? Do you have issues knocking out games the way you used to or have any helpful suggestions or tips for those of us with backlogs larger than we would like to admit? Episode 9 of Constantly Calibrating is brought to you buy choking on coconut water. We however bring you some information on the Stamford Zombie Walk happening this Summer as well as some Phoenix Comic-Con and Nerdist discussion. You can try this direct download link as well, if you wish. Behold the Arcade NEXT All-Stars! SeaNanners vs. Minecraft! A few weeks back we brought you word on a fun thing Microsoft Studios was in the process of doing. As you guys are well aware, those of you who maybe read my article “Microsoft’s ‘Arcade Next’ from a little over a month ago, Microsoft started releasing a series of Live Arcade games 3 weeks back. These games feature twice the maximum gamerscore (400, up from 200) which is expected to roll out to future Live Arcade games as well. Make sure to tune in and check out SeaNanners take on Minecraft tomorrow! Sometime tomorrow we will also be giving out a free code for Minecraft. Check out, and like, our Facebook Fan Page for more info on this and any further contests. Yesterday we told you a little tale about the announcement of The Elder Scrolls Online. Today we bring you the game’s first teaser trailer. For those curious, it’s narrated by Michael Gambon, or Albus Dumbledore to Harry Potter fans. Why are you still reading my commentary up here? Go watch it! Hey we’re back with episode #6 of Constantly Calibrating. For today’s podcast we finally fix the snags we previously experience with Skype and get our good friend Brad Coggins on the podcast. Brad is a huge fan of World of Warcraft and takes the time to give us some info on the ongoing Mists of Pandaria beta. He also fills Steven and I in on the Diablo 3 open beta. The three of us delve into our secret nerd shame as well. Have a listen and let us know what you think! For the time being we have abandoned posting a streamable version of the podcast directly to the site until we can get it working properly. RetroRewind: Leisure Suit Larry 6: Shape Up or Slip Out! Welcome to another installment of RetroRewind. Today we bring you the sixth installment in our tales of Larry Laffer. RetroRewind is a few days delayed this week due to the unfortunate, cruel mistress that is real life. We do have a huge announcement on the subject of Leisure Suit Larry to bring you! Leisure Suit Larry in the Land of the Lounge Lizards: Reloaded is officially funded! As of this morning the Kickstarter campaign has concluded with Larry raising over $655k. What does this mean for Mr. Laffer? Well it means that the upcoming game will have assorted updates to the story, including a new “conquest” for Larry with her own storyline. 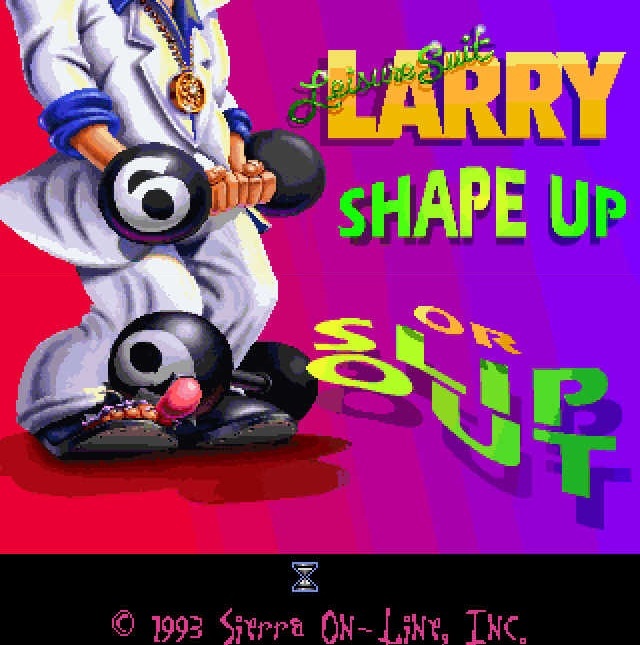 Now with that news out of the way we take you back into the sixth of Larry’s journeys: Leisure Suit Larry 6: Shape up or Slip Out!